Brands continue to persist in reducing women to the sum of their appearance and Dove's latest Choose Beautiful campaign is no different, argues Tom Ellis-Jones, business director at Zak Media Group. There are many things wrong with Dove’s new Choose Beautiful campaign; it’s hard to know where to start. While I take a deep breath, here’s a recap for those that haven’t seen it yet. Dove, the campaigner for real beauty, has travelled to London, Delhi, San Francisco, Shanghai and Sao Paolo to challenge women’s perceptions of themselves. 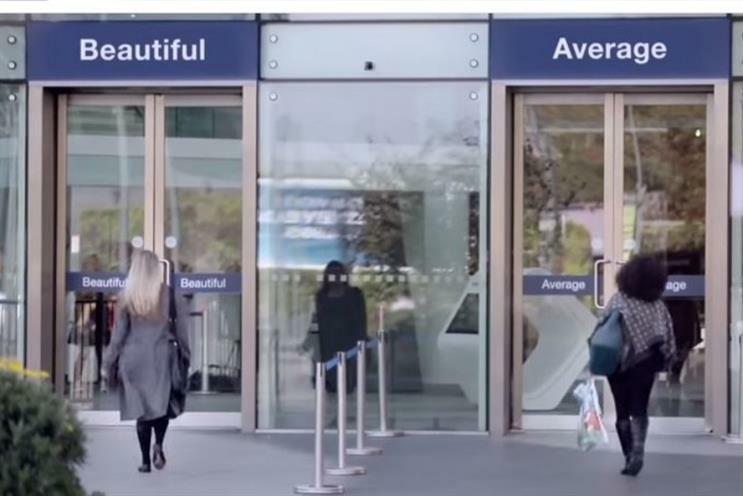 In this so-called ‘social experiment’ it placed two signs above doors into shopping centres - one labelled ‘Beautiful’, the other ‘Average’ and let women make their choice. The message is clear.The result unfortunately is not. It’s a predictably paced, faux-inspirational piece built around a shallow conceit that makes the brand feel insincere and irrelevant. So what’s the problem? Let’s get the trivial things out of the way first. As an idea, it’s OK but it’s not big. It doesn’t come close to the original groundbreaking "Campaign for Real Beauty" or the genuinely powerful and moving "Sketches" that won Dove a well deserved Titanium Grand Prix at Cannes in 2013. It’s also badly executed, devoid of authenticity and the edit feels contrived. As a social experiment, it claims to be observing real people but the casting seems so perfectly engineered that it begs the question: how much was it choreographed? So I dug a little deeper. Sure enough, scroll all the way down the #choosebeautiful Twitter feed, beyond all the largely positive, if PR-generated, comments since the campaign launched on April 7th and you will find a post dated back in October. This was posted presumably when all this was being shot, by Dezi Soley, an actress based in Oakland, CA "feeling blessed en route to Doors/ Choose Beautiful documentary set". Check back to the edit and sure enough, there’s Dezi in the very opening shot of the San Francisco shoot, looking up at the two signs in front of her, pretending to interrogate her perception of her own beauty. Now go back and watch through the remaining 3.5 minutes and tell me it’s hard not to seriously question it’s authenticity; the two friends sat on the sofa, the mother and daughter, the woman in the wheelchair being pushed triumphantly through the word "Beautiful". These are all terrible clichés being dressed up as a genuine social experiment. Don’t get me wrong: there’s a credible message here. But let’s not pretend it’s anything other than an advertisement. However, these executional critiques are trifling issues, believe it or not, compared to the much bigger social question this campaign poses. For that, let’s return to 2004 when Dove first launched its "Campaign for Real Beauty". It was a groundbreaking, category-defining piece of work. With it, Dove not only challenged the entire beauty industry by portraying women with ‘real’ curves and body shapes but it encouraged women everywhere to have the confidence to be comfortable in themselves. The highly awarded ‘Sketches’ from 2013 was also a masterpiece where the brand sought "to create a world where beauty is a source of confidence and not anxiety." Beautiful? Average? What about ambitious, talented, funny, intelligent, creative, and entrepreneurial? But "Choose Beautiful" fails to strike the same chord. And the inherent problem is that the conversation has moved on while Dove hasn’t. In launching a campaign that forces women to label themselves simply as ‘Beautiful’ or ‘Average’, Dove is defining women purely by their beauty.. Isn’t that what feminism has been fighting so hard against? Surely we now live in a post-feminist world where this conversation shouldn’t even be happening? And yet here is Dove, dragging us back to a place where women have to confront a question about something that should frankly be irrelevant. Investigating the campaign content further, I found an interview with director, Paul Dektor, who talks about his interest in the project because he has two young daughters who, he says will have to go through these same issues as they grow up. I also have a young daughter who’s six years old. And my hope is that when she’s older she won’t have to go through this because she’ll be accepted for being a confident, happy, and intelligent young woman. But on this evidence that kind of progress is going to be massively limited because brands like Dove persist in reinforcing this tired trope, and reducing women to the sum of their appearance. My reaction to this campaign has been so strong that I can’t quite believe all the positive comments that are being bestowed on it.. But once all the paid- and PR-generated chat dies down, I’ll be interested to see what the actual consumer feedback will be. Because if it was me, I wouldn’t choose either door. Just like one of the women in the edit. Although, in its typically contrived way, this woman was edited into the narrative in such as way as to suggest the choice between Beautiful and Average was too overwhelming for her; like her self-esteem was so shot to pieces that she couldn’t bear to make that choice. I’d like to think that actually she chose not to take part at all. Because in a post feminist world, women, and indeed the watching world, shouldn’t be confronted with such a banal choice.